Lenten grass is an old Finnish tradition and a lovely way to mark the season of Lent with children. If you're looking for ideas for observing Lent, planting grass is easy to do, fun for the whole family. For adult observers, the Christian season of Lent is often a time of quiet contemplation. For kids, however, Lent seems little more than preamble to Easter’s bonnets and bunnies and baskets. To help children observe Lent, consider adopting the old Finnish custom of planting grass seed in small dishes on Ash Wednesday. For children, it is fun to plant and carefully tend the seeds. Soon delicate blades burst forth from the earth, stretching toward the light. With good care, the grass will grow thick and strong and lush, symbolizing the resurrection and the certainty of spring. Here's how to mark the Lenten Season with Lenten Grass. It's easy, it's fun! Consider starting several trays and giving them to family and friends. Plant the seeds for Lenten Grass on Ash Wednesday. But if you happen to miss Ash Wednesday, I don't think God will mind. :-) Starting a few days later will work too. Start with a pretty bowl or tray about three inches high. For drainage, first lay down an even layer of small rocks – aquarium rocks are perfect. Add a layer of potting soil, the loose stuff works better than dense dirt. Don't fill up the bowl or tray, however, leave room for another layer. Sprinkle the seeds on top of the soil. Be generous! We want thick grass! For grass seed, for a long while I planted rye grass from the local feed store, it costs all of $.40. In recent years, I've planted clover. It's so so pretty! Add a top layer of potting soil. If the soil is dry and airy, use quite a bit because it'll pack down once wet. For visual interest, especially before germination, arrange a few rocks or perhaps pieces of colorful broken china. Be creative! Hey wait! Where'd he come from?! 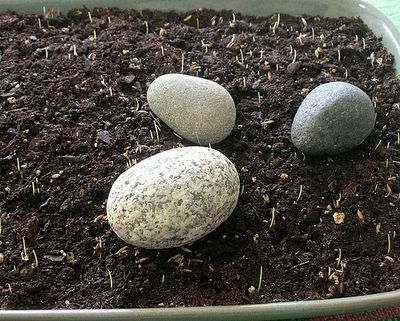 Me, I'm a minimalist and a naturalist so I start with simple stones from my garden. Water the seeds, but not too much, we don't want to drown these little guys! Now the Hard Part: Waiting for Seedlings to Emerge! Now. Place the container in a sunny spot, someplace where it's easy to see, often. I put ours right in the middle of the kitchen table. Moisten the soil every day. Use something with a small spout to control the flow. If you're doing this with kids, a spray mister may prevent over-watering. The soil shouldn't be soaked but it should be moist. And because the soil is shallow, it'll dry out quickly. ... start looking for itsy signs of grass! In fact, leave for a couple of days and you'll miss the first growth and come home to this! This was taken on Day 8. After that, the growth will be fascinating to watch. On sunny days, you'll be positive you can see new growth every couple of hours. Be sure to keep the soil moist. The seedlings need both sun and water! At first, the grass will come up in clumps and seem a little sparse. But don't worry. Soon enough, with sun and water, there will be a thick tray of lush Lenten Grass, green and bright and fresh-smelling, for everyone to enjoy, by Day 10, say. See the clump of dirt? The sheer power of the thrusting grass is impressive! When the grass gets unruly, "mow" it with scissors. From now until Easter, you'll need to "mow" every week or so. If you have a cat, the grass might be a curiosity, unless you have a Finnish cat, like mine, who feigns indifference. Meet Toivo: she's learned that grass doesn't agree with her tummy and leaves the Lenten Grass alone. For a couple of years, I planted wheat grass. 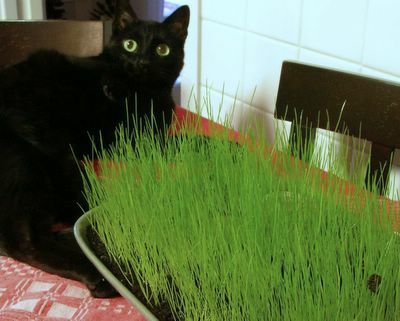 Wheat grass requires a deeper dish and grows more slowly. But by Day 15, the wheat grass is tall and thick and quite pretty. Clover has become my very favorite! It starts off with these pretty little flowers, just like we hate to see in our lawns. I'm reminded of something my mom used to say. "A weed is only a flower out of place ..."
And then this thick carpet of lush green emerges. I'm gonna need a bigger bunny! Can you see how much fun it is to hide things in the grass? I love this old Finnish tradition of planting and tending Lenten Grass, I've been doing it every year since, umm, well a long time ago, more than 40 years. I hope it becomes a favorite tradition in your home too! What type of grass seed, specifically, did you use? And...where did you buy it? I live in Florida and the grass here is quite different than northern varieties. I really want to try this with my kids. Hi Terri ~ I use a rye grass from the local 'feed store' (it's kind of a relic from another era, right here in a St. Louis suburb). The benefit of buying it there is that you can buy just a bit, a quarter pound. I usually buy a bunch, however, so the yard can be over-seeded in a few weeks. But really, I think any kind of grass seed will do and that this time of year, you'll find bags of grass seed at Target, Wal*Mart or a big hardware store. I hope this works for your children, it really is a fun thing. Your cat leaves the grass alone? My three would chomp those suckers down as sooon as they come up! Of course, I buy wheat and rye specifically for them to chew on, so it's probably my own fault. It's been ages since I grew Easter grass. Holidays aren't nearly as much fun when there aren't kids around! Thanks for stopping by my blog...don't know how you came across me but I always love meeting new sisters. This is a great idea! I grew up in Louisiana and Lent was a huge subject since it is an area with a lot of Catholic churches. I do love the tie in to the coming spring and Easter...we may try and use this with our children at church. I'll bookmark this page so that I can come back to it later. Interesting and I will be happy to post your comment. No big deal for me! Thanks for visiting. Thanks for stopping by my site, Alanna. And, for mentioning this post. I was glad I checked it out- that will help remind me to plant some "Lenten Grass" tomorrow! We usually use wheat berries, since I'm at the health food store more often that the hardware store. Just got some vermiculite yesterday. Should be fun! I absolutely love this idea! I'm going to have to try this next year. Maybe a couple. Cat grass for my plant munching feline and something else for us. I'd never heard of this. Thanks for the idea. The reason that there is packages in the pet store of grass to grow for cats is that when the atmospheric change is around, cats get this 'gas' in their tummies and makes them very uncomfortable. They eat grass when they are outside to make themselves vomit and get rid of that 'atmospheric gas' in their tummies. That's why. Outi ~ That’s brilliant! I’ll try it next Lent ... thanks so much for sharing the tip! I've never heard of this tradition (which isn't too surprising, I'm pretty new to the liturgical year in general). What a lovely thing for kids to watch!